Next to Elvis, Johnny Carson was the coolest person I had ever seen. He was a unique combination of Midwestern charm (he was from Nebraska) and New York sophistication. It was so exciting to be up way past my bedtime in the early 1960s with my drinking buddies, Johnny Carson and Ed McMahon. Of course, I was drinking Bosco while sitting in my pajamas on the couch in the family living room. I loved Johnny Carson’s opening monologues, even though I really didn’t understand them. He would makes jokes about President Johnson or New York City Mayor John Lindsay. The audience would laugh uproariously, and so would I, as I wanted to pretend I was sophisticated enough to get the jokes. I continued to watch Carson on Friday nights throughout my childhood. When I went off to college in the 1970s, Johnny was still hosting “The Tonight Show”, and since I no longer had a bedtime, I could watch him every night. During the 1980s, I got a new late night buddy, David Letterman. By the time Dave came into my life, I was a grown-up with children of my own. I would dutifully send them to bed and then stay up past midnight with my TV best friend. 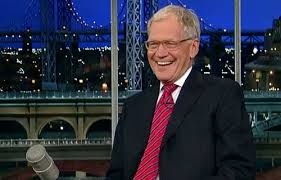 While Johnny Carson was a father figure to me, Letterman was more like a big brother. A smart-aleck, bad boy big brother who was always doing the things I wanted to do like throwing footballs into windows across the street (whether they were open or shut). While Johnny Carson’s humor was subtle and understated (as befits a father figure), Letterman’s was zany. Carson was a modern-day Mark Twain. Letterman was Ernest T. Bass. Carson engaged in witty banter with Gore Vidal. Letterman did stupid pet tricks. I still loved my late night dad, Johnny, but it was crazy brother, Dave, who was Wally to my Beaver. Letterman did all the weird stunts that I dreamed of doing when I was a kid. On one memorable night, he had about 500 Alka Seltzer tablets glued to his suit and climbed into a vat of water. The audience exploded in laughter, and Letterman almost … well, exploded. On another occasion, he wore a Velcro suit and jumped off a small trampoline into a Velcro wall where he was stuck. He was like a real life Wile E Coyote who slammed into the fake tunnel while chasing Road Runner. Johnny Carson was always the King of late night. But David Letterman was the Prince. In 1992, Johnny Carson retired from “The Tonight Show”, and according to many reports, he wanted to have Letterman take his place at the late night desk. But NBC chose Jay Leno, Letterman moved to CBS, and I followed him, grabbing my remote control, and switching from channel 5 to channel 3. Over the years, Leno consistently beat Letterman in the ratings in all American households except for mine. I stuck with Dave, his stupid pet tricks, and above all, his top ten list. Dave did his last show on Wednesday night. I’m going to miss him greatly, although I will get a lot more sleep. I hope they’ll produce a DVD of his best shows. If they do, I intend to buy it, and, reverting to my childhood, stay up late on Friday nights to watch the Letterman reruns. Number 10 - Watching his reaction on stupid pet tricks to a dog who not only catches Frisbees, but throws them! Number 9 - Seeing him toss footballs with Peyton Manning into cabs driving by the Ed Sullivan Theatre. Number 8 - One word: Regis. Number 7 - Watching Dave and Julia Roberts flirt incorrigibly, and wondering why they never got together. Number 6 - Inside jokes with members of the audience. And it didn’t matter a bit that we TV viewers didn’t get the jokes. Number 5 - Visits to Rupert Jee’s Deli. Number 4 - Biff Henderson’s on-location coverage of important national events such as the Super Bowl or the Indianapolis 500. Number 2 - Paul Shaffer, of course. … the way he laughed at himself and made us laugh at ourselves, too. best essay writing service: Letterman may appear like a pompous, interminably thorny mongrel to a few, however for me, realizing that I could turn on the TV and see my unwitting coach on any given weeknight was an inconceivable wellspring of solace, and will miss that more than I can sufficiently express.